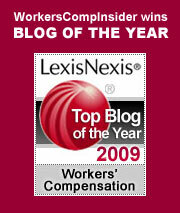 The alarming crisis precipitated by contaminated steroids has implications for the workers comp system. In Framingham, MA, two towns over from where I write, the New England Compounding Center has been shut down, but not before it shipped over 17,000 vials of methylprednisolone acetate, each potentially contaminated by fungal meningitis. Across 23 states, eight people have died and over 100 others have been sickened. As Denise Gray writes in the New York Times, the incubation period appears to be between a few days and a month; the last doses of the tainted medications were administered on September 17, so there are literally thousands of people at risk for a potentially fatal illness. Because the steroid is used for the treatment of back pain, this crisis intersects with the workers comp system. Lower back injuries are among the most prevalent in workers comp; across the country, injured workers are receiving all forms of treatment, ranging from physical therapy to surgery to injections. An unknown portion of those sickened by the tainted drugs will have been treated for work-related injuries. These unlucky few will require lengthy and costly treatment, along with extensive hospitalization. They will be eligible for long-term indemnity payments, including support for any qualified dependents. These claims will total hundreds of thousands of dollars. Should an injured worker suffer a stroke – one of the many side effects of the disease – the claim is likely to become a permanent total disability. The good news, if indeed there is any, is that the source of the contamination is highly specific: it involves only drugs shipped by New England Compounding. Thus any injured workers receiving lumbar injections over the past few months can know for sure whether they are at risk. But that – and the fact that most people exposed to the drug will not become ill – is the extent of the good news. Anyone exposed to the fungus is advised to seek medical help immediately if they experience any of the following symptoms: severe headache, fever, stiff neck, dizziness, weakness, sensitivity to light or loss of balance. For those who have received tainted injections, just reading that list would probably give rise to real or imagined symptoms. Most of the people receiving the tainted medication will soon be able to resume their normal lives. For the relatively small number who become ill, or even die, the promise of relief from back pain has been transformed by a scandalously unregulated industry into a broken promise of life-altering proportions. For those wondering what role, if any, government should play in free markets, this surely is an example of a place where government belongs. This entry was posted on Tuesday, October 9th, 2012 at 9:51 am	and is filed under Compensability, Disability, health care, Medical Issues. You can follow any responses to this entry through the RSS 2.0 feed. You can skip to the end and leave a response. Pinging is currently not allowed.